Time for another monthly recap on the 365 project, which, as luck would have it, is also my hand stitching at the moment. There are 99 circles here so far, and my end date is November 7th, so theoretically I could just keep making little squares until then. I may do just that. Alternatively I might start piecing some bits together now. I have no more of the blue shirt left and one more week's worth of bits of pink, but I think there's maybe a couple of weeks to be eked out of the last of the red. That would take me to October I reckon. On one level I'm happy to keep just letting this one tick over and focus on my other piecing; on the other hand if I run out of the original shirts that changes things, although at least I have some options now in terms of what next. I have always laid these out on the floor pretty much at random but yesterday when I was doing my photos it occurred to me to try being a bit more organised. I quite like this. I'll link up today with Quilty Folk - check out all the other circle-y stuff that's been happening, and with Kathy's Quilts for Slow Sunday Stitching. Both layouts look good, but maybe the first would be easier to add other fabrics to if you run out of these shirts. I like the second layout, too. Maybe introduce another shirting now for the remaining ones to be done? Love it! I like the random layout better...and it will be easier to add to! Clearly, the cat has other ideas for the layout of your blocks!!! I like the random layout. Have fun stitching today. I like both layouts, but maybe the second one a little better, since my mind is always trying to organize pieces into patterns. Every time I see your circles, I wish I was doing them, too, until I remember how utterly over-committed I am, already, which is why I didn't take this one on! I salute your for your persistence. This will be another interesting and unique Kaja quilt! So fun to see how far you are with your circles and two possible layouts so far. I think they're both great! Oh what a difference your layout made. My dog always has to step on everything when I lay things out. I think they are jealous of our quilts. I like the circles when they are organised much better. Enjoy your stitching. I took a break from 365 but just today decided that I need to do something with the blocks so I've started putting them together. I am loving your second layout, but sometimes I like order and this one makes good sense to me. They are all so pretty with your hand stitches. I can't wait to see what comes of them. Looking good. It's always fun playing with blocks. The circles look great with your two different backgrounds. I like the second layout especially. You think you've got the pattern and then oops! it's not there. 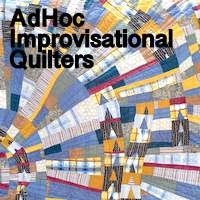 Just the kind of humor I like in a quilt. I do like the more random one too. Loving your blocks! The first one kind of reminds me of a Tetris game! :) Pretty cool! I prefer the first random version, for me there is more interest. I love your pics on the tiled floor, it gives a great sense of perspective, although in reality I don't know if the tiles are 12 inches or 20. I do love what you do with circles and squares . I've been collecting shirts for a while , I must think what to do . I need to take my circles out and play with some layouts. I have ideas, but too many kids tromping through to want to take over the floor just yet. :) Your circle quilt looks great. Love that stiching! I agree with Miaismine, that the first one looks a little like tetris. :) I think I like the second layout a little better, but it's a tough choice! They're both pretty. Your circles are coming along quite nicely. Whatever you decide, I am sure it will be beautiful.